It seems that even Marilyn Monroe‘s beauty was not all due to mother nature. Marilyn got a little help from her friendly Plastic Surgeon, according to the week’s issue of GLOBE Magazine. 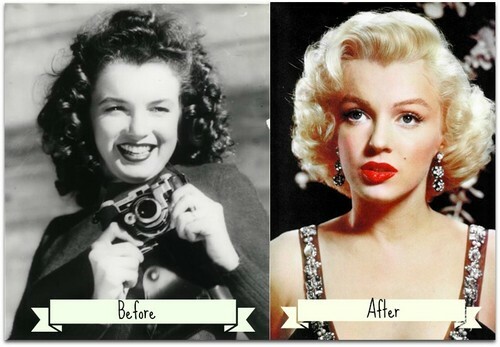 Marilyn was in fact one of the first celebs to get plastic surgery. “At that time, going back to the 1950’s people didn’t go for the plastic surgery procedures. It was very, very new.” It is for this reason it was kept secret, can you imagine how shocked people would have been back then? The info was all revealed when notes and x-rays from Plastic Surgeon Dr. Michael Gurdin medical files between 1957 and 1962 went up for auction at Julien’s Auctions in Beverly Hills. The are expected to bring in $30,000. In the files Gurdin reveals that Marilyn went through a variety of procedures from 1950 – 1962, including a cartilage implant in Marilyn’s chin that was dissolving, a partial nose job and a tip rhinoplasty. There have been rumors over the years she had breast enhancements but the notes do not substantiate this. Everyone wants to believe that Marilyn was a natural beauty. There always has been speculation of, “did she or didn’t she?” One thing is certain, Marilyn felt if her looks went so did her fans and she was willing to do what it took to keep them. When it comes to Hollywood there doesn’t seem to be any natural beauties only doctors creations. The reason the info is being released now is because after 50 years the right to medical privacy ends and Marilyn has been dead 51 years.